Will the Real ID Law Prevent You From Flying? Additionally, the law also requires that the applicant present documentation of name, birth date, social security number and an ID with a photo or an ID with full legal birth name and birthdate. Yes, a person needs an ID in order to obtain a commonly used ID; but more on that later. Although the Act was passed in 2005, five states, Missouri, Minnesota, Illinois, New Mexico, and Washington, have not updated their driver’s licenses to meet federal standards. This actually isn’t surprising; the Real ID Act was extremely controversial when it was first passed and it was doubtful that any states would actually comply. Missouri went so far as to pass a law in 2009 prohibiting state officials from even considering complying with the Real ID Act. However, the TSA forbids travel with state driver’s license that does not comply with the Real ID Act. People using driver’s license that do not meet the Real ID Act’s requirements would not be able to board a plane. States have had a variety of reasons for opposing the ID law.Conservative leaning states saw the Real ID Act as federal overreach; liberal leaning states believe the requirement to have an ID to obtain an ID was discriminatory against minority groups that make less income. People concerned about having their birth date or parts of their social security number have opposed it. As a result, the federal government has often granted extensions to states to meet the requirements. 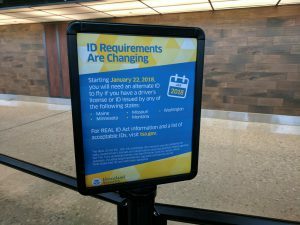 Missouri was granted an extension if it agreed to repeal its Real ID Act ban. The extension would allow Missouri residents to continue using their non-complaint driver’s license until January 22, 2018. Of course, the Real ID Act only affects driver’s licenses. If you use a driver’s license that doesn’t comply with the Real ID Act, you will be barred from entering the plane unless you have other forms of identification. So even if you live in one of the five states that still refuse to comply, you can always use a passport or an ID issued directly by the Department of Homeland Security to fly. Some states even issue licenses that comply with federal regulations even though they still use the old pre-Real ID Act licenses – check your local DMV for details. On the other hand, these alternative identifications create additional expenses. Obtaining a passport, ID from DHS, or a state ID that matches the requirements will cost more money. This is a constitutional concern, as the Supreme Court has historically found traveling between states to be a fundamental right. Charging people extra money would potentially burden this right. Unlike voting though, there are other means of moving around the country. It is possible to travel from New York to Missouri by driving a car, riding a bus, or forming a carpool. With states like Missouri reversing their Real ID Act ban, it’s only a matter of time until all state driver licenses are regulated by federal standards. We promise to send the best stuff only and you can opt out any time.